Claudia Russell’s modest, graceful vocals toggle quite easily between the light and heavy sentiments encased here in well-crafted lyric sets, track after track. This lyrical skill is matched up with roots-grounded melodies adorned with fresh-sounding, sophisticated bridges and choruses. 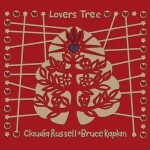 Spouse and bandmate Bruce Kaplan collaborates on a pair of particularly moving songs, “Lived In The Trees” and the title track. Other standouts include “Land of Plenty” and “Lately I’m Thinking About You”. Instrumental backup is splendid throughout.